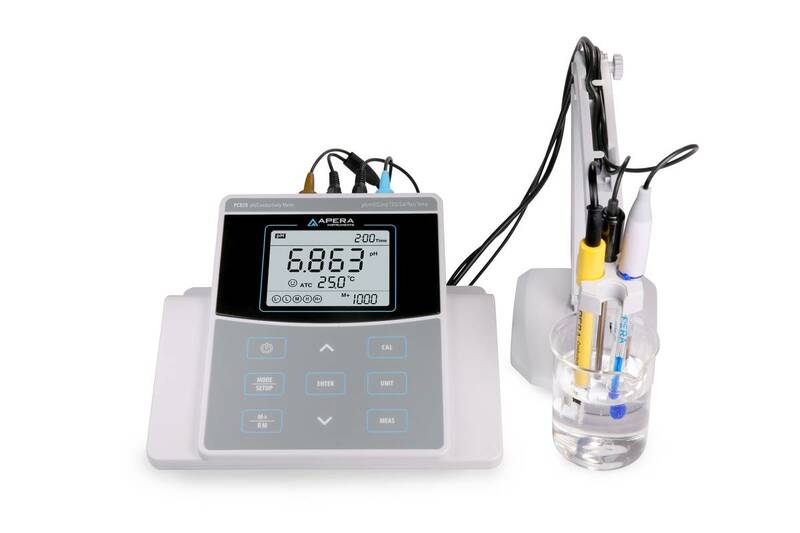 The Apera Instruments PC820 Benchtop pH/Conductivity Meter provides reliable pH and conductivity measurements with various intelligent functions and a durable structure. Equipped with Swiss LabSen 211 Combination pH electrode and Precision BPB (Brush-Resistant Platinum Black) glass conductivity electrode (2401T-M), the meter measures pH/EC/TDS/Salinity/Resistivity/Temperature in a stable and accurate manner. ORP (Redox) measuring mode available (ORP electrode sold separately). Equipped with the LabSen® 211 Combination pH Electrode made with Swiss sensor technologies and materials, featuring an impact-resistant and bubble-free sensor tip, and a long-life reference system; compatible with TRIS buffer. Intelligent Functions: Quick & Easy Auto Calibration up to 5 points. The Smart Self-Diagnosis helps you conduct proper calibrations and monitor the condition of your probes with slope data display between calibrations. Calibration reminder and date check functions are also available. 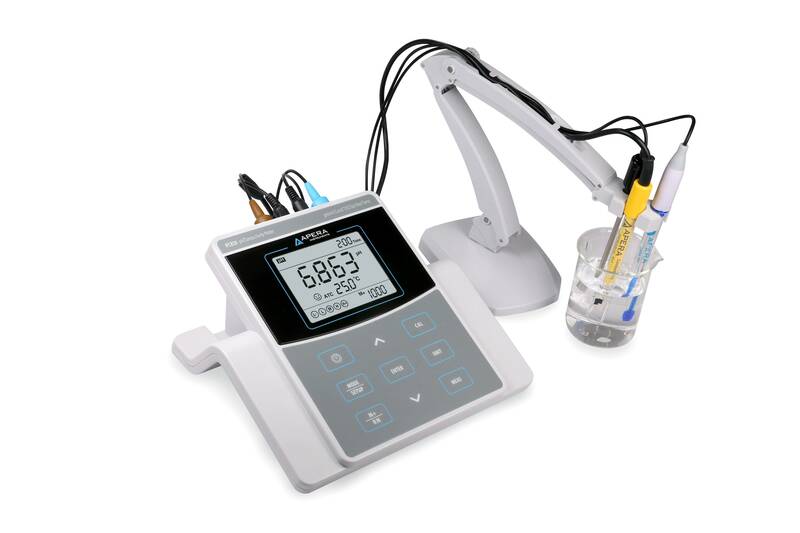 The large clear backlit LCD displays pH/EC/TDS/Salinity/Resistivity and temperature simultaneously along with icons of stable readings and finished calibrations. GLP Data management (1000 groups of data storage), USB data output and PC software support. Auto timing measurement/data logging mode available. Reliable Structure: IP54 water-resistant. It comes with a complete test kit including a meter, a pH electrode, a conductivity electrode, a temperature probe, a flexible electrode holder, a PC-Link software flash drive (Windows-based system only), a USB cable, a power adaptor (input: 120V AC 60Hz; Output: 9V--300mA), and 6 bottles of calibration solutions (4.00 pH, 7.00 pH, 10.01 pH, 84μS/cm, 1413μS/cm, 12.88mS/cm). The product is CE certified and comes with a Three-Year Warranty for the meter, and a 6-Month warranty for the electrodes.